Human Resources & Educational Opportunities For You & Your Employees! Get a jumpstart on hiring summer seasonal help at the DublinWorks! Student Job Fair. Held in conjunction with Dublin City Schools, this job fair matches Dublin businesses with students looking for summer employment, internships or volunteer opportunities. At the event, come prepared to meet with students, review resumes and conduct interviews. Chamber members may reserve a free booth on a first-come, first-served basis. Even with all of the health care reform changes, Dublin Chamber members with 2-50 employees have options for discounts on health plans from Anthem Blue Cross Blue Shield. Members are eligible for industry-leading HSAs, HRAs and HIAs. As an additional option, the Southern Ohio Chamber Alliance recently partnered with Chambers of Commerce across the state to form a self-funded medical plan, known as a multiple employer welfare arrangement (MEWA). This plan enables multiple smaller employers to join together to share in overall claims risk. By being a part of a larger, self-funded pool, participating employers will have financial protection backed by Anthem’s stop loss coverage, fixed monthly payments and more rating stability while preserving flexibility for plan participants. These plans are available for Chamber members who do not already have Anthem insurance. For more information, call 1-888-506-1574. CompManagement is the Dublin Chamber of Commerce’s third party administrator for workers’ compensation specializing in premium discount programs, claims management, cost containment, client education, safety services and unemployment consultation. Join other chamber members already seeing their annual workers’ compensation premium reduced by participating in group rating, group retrospective rating or other alternative discount programs available in Ohio. If your organization is not yet participating in this member benefit, and you would like to receive a free, no-obligation analysis from CompManagement to see how much your organization can save, contact Rejeana Woolum-Napier at 614-359-2403. 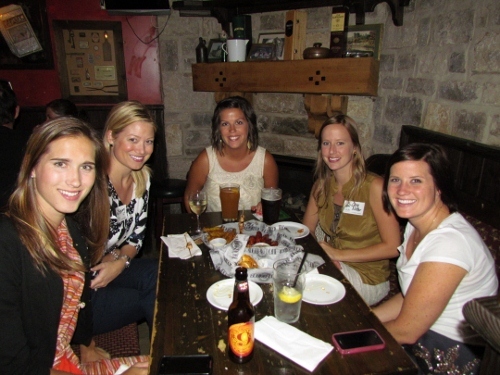 The Dublin Chamber of Commerce offers a group for young professionals under the age of 40 who work or live in Dublin. The group meets to provide education, social opportunities and outlets for community involvement. Go online for additional information. Looking for employees to fill that prime position in your organization? The Dublin Chamber’s Online Career Center has the answer. Post your job openings online for free. The Dublin Chamber of Commerce Lunch & Learn Series offers professional advice on topics relevant to small businesses, such as technology, marketing, social media, customer service, sales, human resources and finding capital. The two-hour seminars are held at the Dublin Chamber of Commerce from 11:30 a.m. to 1:30 p.m. For a list of upcoming sessions, visit our calendar of upcoming events. Show your employees you value them by sponsoring them for the Dublin Chamber of Commerce Leadership Academy. The Leadership Academy is designed to help groom young professionals to attain success in their careers and personal lives. This dynamic career development program is taught by central Ohio experts and business leaders, and is held in six convenient after-work sessions beginning each January. Call the Chamber at 614-889-2001 for details or to register. Invite the human resource executives in your organization to join the Dublin Chamber HR Executive Council, a group that meets every other month over lunch to discuss timely HR issues and opportunities. Members network with peers in the industry and select topics for discussion including healthcare, employee retention, succession planning, and more. The Leadership Dublin Executive Program is designed to educate and inspire leaders for community service. A very unique experience of relationship building, problem-solving, civic engagement and personal growth, this eight-month program is designed to give participants the tools needed to become active and influential leaders in the community. As part of the program curriculum, participants work on a community project to gain insight and understanding of issues facing leaders. For additional details, click here. In an effort to provide new Dublin-based employees with everything they need to know about the Dublin community, the Chamber has compiled a New Employee Packet to be distributed upon request. Included in the packet is a detailed Dublin street map, a Chamber Directory, a calendar of events and more! Any Dublin Chamber member may promote their business in this packet for a small fee. Please call the Dublin Chamber for details.